Design House has sponsored the signage artwork design requirements (valued at $1,000 +) for the Cane to Coral inaugural 15km run to be held in Bundaberg. I think I may also participate in this event 🙂 All welcome! 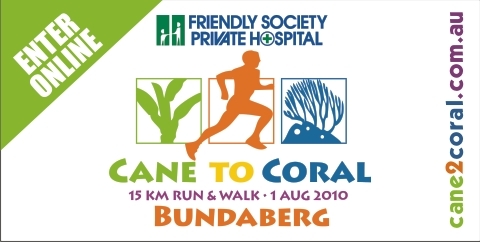 Sunday 1st August 2010 Get those legs ready and join 2,500 other runners and walkers along the Cane to Coral Fun Run and Walk. Whether you’re an elite runner or a weekend walker, make sure you’re part of the action – stroll or sprint, roll or run or even travel by pram! Whatever you choose, you will be helping to support The Queensland Cancer Counci and Bundaberg Surf Life Saving Club…. Click here to learn more or enter online!